In this post, only natural forcings are used to simulate the Global Temperature Anomaly curve. The correlation is closer than any other attempt of this kind that I’ve seen to date, with or without anthropogenic forcings and with or without General Circulation Models (GCMs). Consider two things: First, most GCMs that government entities employ to make projections about future global climate do NOT model El Nino-Southern Oscillation (ENSO) events, even though ENSO is a dominant natural climate phenomenon. Second, those few GCMs that attempt to model ENSO events do NOT model their processes or the climate responses before, during, or after the events with any accuracy, though they are improving. In the following, I provide a recipe so that anyone familiar with a spreadsheet and who’s capable of downloading data from the links could reproduce the results with little effort. It’s also important to note that I am not attempting to disprove the hypothesis of Anthropogenic Global Warming (though I am skeptical of the proejections). However, I am very clearly illustrating that more effort needs to be expended to isolate natural and anthropogenic causes for the warming over the past 130+ years, especially the long-term effects of ENSO. This should be done before attempting to project the anthropogenic causes of warming into the future by 100 years or more. GCM simulations of ENSO must be improved to accomplish that. In a series of posts titled “Can El Nino Events Explain All of the Global Warming Since 1976?”, I illustrated a number of the processes that take place during and after an El Nino event, and also showed how the response of the East Indian and West Pacific Oceans to El Nino events created step changes in global Sea Surface Temperature (SST). Please review those posts (links follow) if you’re not familiar with them. The questions, answers, comments and responses at Watts Up With That that remained on-topic provide additional insight. One of the primary points discussed in the “Can El Nino Events Explain All of the Global Warming Since 1976?” series was how El Nino events redistribute warm water from beneath the surface of the Pacific Warm Pool to the surface of the East equatorial Pacific, in the NINO regions. Those warm waters are then driven to the East Indian and West Pacific Oceans by Pacific equatorial currents and by trade winds. In the East Indian and West Pacific Oceans, when not suppressed by volcanic eruptions, those redistributed warm waters cause a noticeable rise (step change) in SST anomalies, which then blend over time with the balance of the global oceans. I used a running total of NINO3.4 SST anomalies in Figure 21 of Can El Nino Events Explain All of the Global Warming Since 1976? – Part 2 to illustrate the phenomenon over the term of the data. As noted in the discussion of Figure 21 of that post, if a coefficient is applied to the NINO3.4 SST anomalies before the running total is calculated, the resulting curve will mimic the global temperature anomalies. Refer to Figure 1, below. This step in reproducing Global Temperature Anomalies creates a curve that simulates the slopes of the rises during the early and late 20th Century, and the slope of the decline in global temperature from the mid-1940s to the late-1970s. The underlying curve of the Reproduction data was driven by ENSO events alone. At the bottom of the last link is a notation that identifies HADSST as the source. The data runs from January 1871 to December 2007, which is the period of the graphs in this post. Note 4: As illustrated later in this post, the same effect will occur if the Trenberth and Stepaniak NINO3.4 SST anomaly data is replaced with the HADSST version of NINO3.4 SST anomaly data. The anomalies, though, must be created with the period of 1950 to 1979 as the base years. Note 5: The coefficient used as a scaling factor in Figure 1 is 0.0052. In the paper “Evolution of El Nino–Southern Oscillation and global atmospheric surface temperatures” (2000), Trenberth et al state on page 4, “The regression coefficient based on the detrended relationship is 0.094 deg C per N3.4 and is deemed more appropriate. The N3.4 contribution is given in Figure 3. It shows that for the 1997–1998 El Nino, where N3.4 peaked at ~2.5 deg C, the global mean temperature was elevated as much as 0.24 deg C (Figure 2)[Their Figure 2], although, averaged over the year centered on March 1998, the value drops to ~0.17deg C.” Dividing 0.17 deg C by 2.5 deg C leaves a yearly scaling factor of ~0.068 or a monthly scaling factor of ~0.00567 (0.068/12). I used 0.0052. Note 6: The January 1871 data is also offset by -0.34 deg C to align it with the HADCRUT data. Note 7: The accuracy of NINO3.4 SST anomaly data decreases before the opening of the Panama Canal in 1914. There was less ship traffic in the NINO3.4 area before that year. This could explain the divergence in the early part of the data. This was as far as I originally intended to carry this post. I was going to use it as a supplement to the “Can El Nino Events Explain All of the Global Warming Since 1976?” series, but then the smoothness of the Global Temperature Anomaly Reproduction caught my eye. That curve would make a good basis from which to illustrate the minimal effects of the variations in global temperature due to changes in solar irradiance--those caused by the solar cycles. It could also highlight the short-term impacts of volcanic eruptions. Figure 2 is a graph of monthly sunspot numbers that were scaled to illustrate the presently accepted impact on global temperature anomalies of variations in solar irradiance caused by solar cycles. Sunspot data was used as a proxy for Total Solar Irradiance because there are no TSI datasets that provide monthly data available--at least none that I’ve found. The data was shifted by the average sunspot number for the period of January 1871 to December 2007, creating “anomalies” from the average. The scaling factor used is 0.0006. Adding that scaled Sunspot Number Anomaly data to the Global Temperature Anomaly Reproduction data shows the minimal effects of the solar-cycle-caused variations in solar irradiance on global temperature. Refer to Figure 3. The differences between Figure 1 and Figure 3 are so small that it’s difficult to see them without a blink comparator or gif animation, Figure 4. Note how, due to the timing of the solar cycles, the La Nina trough at 1975/76 was lowered and El Nino peak in 1997/98 was increased, adding to the rise in global temperature over that period. With that said, it must also be noted that all La Ninas do not occur during solar minimums and all El Ninos do not occur during solar maximums. The Sato Index of Stratospheric Mean Optical Thickness is available through GISS. In Figure 5, the Sato Index data has been inverted and scaled by a factor of -2.4 to show the impacts on Global Temperature anomalies of explosive volcanic eruptions. The scaling factor was selected to approximate the middle of the range of 0.2 to 0.5 deg C (the range of temperature drops associated with the Mount Pinatubo eruption of 1991). Adding the scaled and inverted Sato Index data to the Global Temperature Anomaly Reproduction data, the effects of volcanic aerosols are illustrated. Refer to Figures 6. Figure 7 is a gif animation that highlights the differences between the Global Temperature Anomaly Reproduction data that’s been adjusted for Solar Forcings and the data that’s also been adjusted for volcanic aerosols. Note how global temperature anomalies were depressed by volcanic aerosols from the early-1880s to the mid-1910s and from 1960 to the late-1990s. Excluding the two minor eruptions, the period between the mid-1910s and 1960 was quiet. Figure 1 illustrated the slow, smooth variations in global temperature anomalies caused by the underlying small step changes in global temperature anomalies resulting from ENSO events. But ENSO events are also reflected in the global temperature record as positive “spikes” for El Nino events and negative “spikes” for La Ninas. Typical lag periods between the peak of an El Nino and the corresponding peak in global temperature anomaly are approximately 3 to 6 months. To simulate those effects (termed ENSO Noise in this post), the NINO3.4 SST anomalies are shifted 3 months and scaled by a factor of 0.09. Refer to Figure 8. Adding the ENSO Noise to the Global Temperature Anomaly Reproduction data helps to amplify the peaks and valleys of the smoother data that was created with the running total. Refer to the gif animation, Figure 9. Note how it exaggerates the ENSO events and alters the impacts of the 1982 El Chichon and 1991 Mount Pinatubo volcanic eruptions. This can be better illustrated in the short-term (January 1978 to December 2007) graph of the HADCRUT Global Temperature Anomaly data and that Global Temperature Anomaly Reproduction data that have been adjusted for Solar, Volcanic Aerosols, and ENSO Noise, Figure 10. There are some minor differences. Figure 11 is a comparative graph of the HADCRUT Global Temperature Anomaly data and the Global Temperature Anomaly Reproduction data from January 1940 to December 1979. There are periods when the datasets diverge, but considering the recently found discontinuity in SST data in mid-1940s, the agreement is reasonable. In Figure 12, the comparison of HADCRUT Global Temperature Anomaly data and the Reproduction of Global Temperature Anomaly data has been shifted forward in time to January 1900 to December 1944. From 1903 to 1944, the Reproduction mimics the HADCRUT Global Temperature anomaly date remarkably well, especially when the accuracy of the data during that period is considered. The comparison from January 1871 to December 1909 is shown in Figure 13. Note how they diverge in 1903/1904. In Figure 14, the Global Temperature Anomaly Reproduction data have been shifted up 0.3 deg C. The Reproduction data now mimics the HADCRUT data from 1871 to 1903. It appears there may have been a step change in the NINO3.4 anomaly or the HADCRUT Global Temperature Anomaly datasets around 1903/04. Figures 15 and 16 compare the Reproduction of Global Temperature Anomalies (Solar plus Volcanic Aerosols plus ENSO Noise) to GISS and NCDC Global Temperature Anomaly data. A different scaling factor (0.0045) was needed for the running totals and the ranges were shifted to accommodate the differences in base years. In Figure 17, the Trenberth and Stepaniak NINO3.4 SST anomaly data was replaced with raw HADSST NINO3.4 SST anomaly data (Base years = 1950 to 1979). The Trenberth and Stepaniak data has been smoothed and standardized, but the HADSST data has not. Therefore, the scaling factor for the running total was changed (to 0.0073) and the starting point was shifted to account for these differences. This graph was provided to show that the Reproduction of Global Temperature Anomalies was not solely a function of the Trenberth and Stepaniak NINO3.4 SST anomaly data or the smoothing and standardizing they used. Note: This was originally a two-part post. I discovered an error in the spreadsheet that was used to create the graphs for the second part. When corrected, the additional adjustment did little to enhance the reproduction so I’ve deleted Part 2 and the supplement to it. There will be those who will note that I provided no scientific basis for the use of a running total to simulate the long-term effects of ENSO. I have, however, in this post and the posts I’ve linked, illustrated the processes and their effects and explained why the running total reflects the underlying step changes caused by ENSO. There will be those who will say that the reproducing the Global Temperature Anomaly curve with a running total of the NINO3.4 data is to be expected. I disagree. If that were so, why are there no studies noting the effect? Recent Antarctic Warming Attribution Complicated By ENSO Events? I’ve moved to WordPress. This post can now be found at Recent Antarctic Warming Attribution Complicated By ENSO Events? It should easy to attribute the warming to ENSO events. It’s already been done. The recently released paper by Steig et al (2009) “Warming of the Antarctic ice-sheet surface since the 1957 International Geophysical Year” generated a lot of buzz on the climate blogs today. But I found the post at RealClimate my Michael Mann and Eric Steig, co-authors of the study, the most enlightening. It would seem logical to conclude that the current bout of warming in the Western Antarctic could be attributable to the recent almost three-decade-long bout of ENSO activity that has been dominated by El Nino events. The following are the comments with graphs that I posted at Watts Up With That. Notice a theme? The following are graphs of Antarctic and Southern Ocean TLT [AHU MSU] created from data available through the KNMI Climate Explorer Website. Keep in mind that the MSU satellite data does not reach the entire Antarctic. In fact, RSS only lists data as far South as 70S. AHU extrapolates, smoothes, estimates, whatever, to provide data for the rest of the Antarctic. Regardless, here are additional graphs of the AHU TLT data for the Antarctic to add to the ones I put up yesterday for those discussing the Antarctic off-topic on the previous thread. You’d have to segment the data looking for an area that’s warming differently that the rest of the continent in order to come up with one that’s even more significant. Here are the graphs I posted as part of the off-topic comments on yesterday’s thread. Has the Antarctic warmed? Yes. Has it warmed in recent years? No. Unless you use surface temperature data, then you have a rise in recent years. One of the authors of the Nature paper, Eric Steig, made an appearance at Lucia’s website and had a discussion with Roger Pielke Jr that’s worth reading. I, of course, had to throw a few graphs into the conversation. I should be posting the rest of the Antarctic data in a day or two at my website. 1. The NCDC and CRUTEM anomalies have increased since 1969 (period referenced in the study), while GISS remained relatively flat. The study wouldn’t deal with this, just an observation. 2. There appears to be a difference in the number of sampled surface stations between NCDC and the other two from the 1960s to the early 80s. Also not related to the study. 3. But, related to the study, during periods of volcanic activity (excluding El Chichon), year-to-year variability appears to decrease. 4. And the NCDC and CRUTEM data appear to have step changes that could be linked to the 1982/83 and 1997/98 El Nino events. Did the paper discuss these, especially the ENSO-induced step changes? It ceases to amaze me that, on one hand, AGW proponents will voice their current understanding of the limited impact of solar irradiance on climate, but, then, on the other, they resurrect a graphic prepared using obsolete solar irradiance data to emphasize their belief that Anthropogenic Greenhouse Gases have dominated climate over the last 40 years. Figure 1 is an illustration of Climate Change Attribution from the Global Warming Art website. It was recently used in a discussion on climate change at another blog. Does it really show the ability with which GCMs can reconstruct the historical temperature record? Let’s check. The reference listed by Global Warming Art is: Meehl, G.A., W.M. Washington, C.A. Ammann, J.M. Arblaster, T.M.L. Wigleym and C. Tebaldi (2004). "Combinations of Natural and Anthropogenic Forcings in Twentieth-Century Climate". Journal of Climate 17: 3721-3727. The solar study referenced by Meehl et al is Hoyt and Schatten (1993) "A discussion of plausible solar irradiance variations". Yes, that’s right, 1993. Refer to Table 1 in Hoyt et al and to the discussion on page 3723 to confirm the source of solar data. Figure 2 is a comparative graph created by Leif Svalgaard of several TSI reconstructions and composites. Note that the current understanding of TSI variability is represented by the Svalgaard (red) curve and that the Hoyt data is represented by the light gray one. That’s a significant difference. The Hoyt data is obsolete. So the graph that Global Warming Art uses is actually a confirmation of a GCM’s INABILITY to match the historical temperature record, because it relies on obsolete TSI data to make the curves fit in early years. 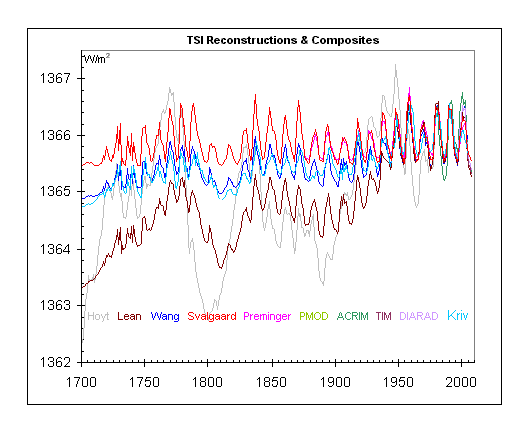 Figure 3 is a comparison of the Hoyt and Svalgaard TSI data from 1880 to present without the noise of the additional datasets. To scale it to Deg C, I assumed that from peak to trough global temperature has varied 0.1 deg C for the past three Solar Cycles and that the average variation in TSI over those Solar Cycles is 1 Watt/Meter^2. That agrees with the current understanding of the impact of solar irradiance on global temperature. The scaling factor is therefore 0.1 Deg C/(Watt/Meter^2). To shift it into the range of global temperature anomalies, I subtracted 1366.5 Watts/Meter^2 before scaling it. Figure 4 is the result. The problem is becoming obvious. Now let’s add GISTEMP Global Temperature anomaly data to the graph. Refer to Figure 5. The “match” between global temperature anomaly and scaled Hoyt TSI curve isn’t bad. Unfortunately, the Hoyt TSI data is obsolete. The scaled Svalgaard TSI curve represents the current understanding. The Meehl et al study had to use a solar forcing that was extremely unrealistic in order to reproduce the warming in the early part of the 20th century. If the forcings they employed are so erroneous in the early years, is there any reason to believe the anthropogenic forcings in recent years are realistic? The following is a graph of the latest and greatest version [ERSST.v3b] of NINO3.4 and Southern Ocean SST anomalies. It’s always struck me that there was an underlying component of the Southern Ocean SST anomalies in the NINO3.4 SST anomaly data, but proving it is beyond my capabilities. Even though I’d be reprimanded for it, the best I could do would be to put a 6th-order polynomial trend line of the NINO3.4 data on the graph and say, “Hmm, that looks like it fits,” which is exactly what I’ve done in that graph. Low latitude Northern Hemisphere lower troposphere temperature (TLT) anomaly data has been divided by longitudes in this post to reflect continents and oceans. As a reference, low latitude (0 to 30N) TLT anomalies of the Northern Hemisphere are illustrated in Figure 1. ENSO events and the 1982 and 1991 volcanic eruptions of El Chichon and Mount Pinatubo dominate the lower troposphere temperatures (TLT) of the Northern Hemisphere’s lower latitudes (0 to 30N). This should be obvious in Figure 1. It will also be obvious with the segmented data, especially when compared to NINO3.4 SST anomaly and Sato Stratospheric Mean Optical Thickness data. There are two other effects worth noting in the following. First, the bias introduced by the volcanic eruptions. The volcanic eruptions of El Chichon (1982) and Mount Pinatubo (1991) lower the global TLT anomaly data in early years, thereby increasing the overall trend. The lower latitude TLT anomaly data for the Northern Hemisphere illustrated in this post reinforces that. Note 1: The Lower Troposphere Temperature (TLT) anomaly data identified as AHU MSU was accessed using the coordinate-based system available through the KNMI website. They cover the period of January 1979 to November 2008. The NINO3.4 SST data is ERSST.v2 data available through the NOAA NOMADS system. The SST anomaly data for the SST versus TLT comparative graphs (Figures 22, 23 and 24) is OI.v2 SST data, with a higher resolution that the ERSST.v2 data used for NINO3.4. The reason for the two SST datasets is the OI.v2 data does not cover the entire time period of the TLT data, while ERSST.v2 does. The Northern Hemisphere Sato Index data is available from GISS. All TLT data in the graphs (with the exception of Figure 1) have been smoothed with a 12-month running-average filter. The data is raw in Figure 1. NOTE 2: NINO3.4 SST anomaly and Sato Index (mean optical thickness of stratospheric volcanic aerosols) data are provided to aid in the illustration of the timing of the ENSO and volcanic eruptions only. They have not been scaled for any other purpose. The NINO3.4 SST anomalies are adjusted by factor of 0.24. The Sato Index data has been inverted using a factor of -3. They also have not been smoothed. NOTE 3: I’ve divided the low latitudes of the Northern Hemisphere into subsets as shown in Figure 2 to reflect the TLT anomalies over the oceans and continents. I used the same longitudes as the previous post in this series that covered the mid latitudes of the Northern Hemisphere. Figure 3 is a comparative graph of low latitude Northeast Pacific TLT anomaly and scaled NINO3.4 SST anomaly and Sato Index data. The first thing that stands out is how well the low latitude Northeast Pacific TLT anomalies and scaled NINO3.4 SST anomalies correlate. They should, since the majority of the Northern half of the NINO3.4 region is contained by the area of the low latitude Northeast Pacific TLT anomaly data. The second thing: There was little to no impact by the 1982 El Chichon eruption on the low latitude Northeast Pacific TLT anomalies, while the 1991 Mount Pinatubo eruption did flatten the response to the El Nino events then. Note the varying responses to ENSO events and both volcanic eruptions. Lag times to the 1997/98 El Nino also increase as the datasets move east. Low latitude Northwest Pacific TLT anomaly, scaled NINO3.4 SST anomaly and scaled (inverted) Sato Index data are compared in Figure 8. Note how little the Northwest Pacific TLT anomalies react to the 1997/98 El Nino compared with the other datasets. Note also that it rebounds to near the El Nino-caused peak in 2002 after dipping with the 1999/2000/2001 La Nina. That step change is better illustrated in the following section. During the ~30 years of data, there were two significant El Nino events that were not suppressed by volcanic eruptions, the 1986/87/88 and 1997/98 El Ninos. The peaks of the TLT anomaly responses to those El Ninos occur near to January 1988 and January 1998, making those months a good place to separate the datasets. The processes that caused step changes in global SST in response to those El Nino events are discussed in the two posts titled Can El Nino Events Explain All of the Global Warming Since 1976? – Part 1 and Can El Nino Events Explain All of the Global Warming Since 1976? – Part 2. In Figure 9, the period averages have been added to the graph of low latitude Northwest Pacific TLT anomalies. Using those averages as reference, the 1997/98 El Nino shifted low latitude Northwest Pacific TLT anomalies, increasing them by approximately 0.23 deg C. The response of the low latitude Northwest Pacific TLT anomalies to the 1991 Mount Pinatubo eruption was greater than the El Chichon eruption in 1982. This lowered the average TLT during the period of January 1988 to December 1997, offsetting some of the increase caused by the 1986/87/88 El Nino. An interesting graph, Figure 10 provides the same comparison for the low latitude Northeast Pacific TLT anomalies. There were little changes in the Northeast Pacific TLT anomalies. This is caused by the dominance of ENSO events on that data. (There is no trend to speak of in NINO3.4 SST anomaly data from January 1979 to November 2008. It is flat.) The suppression of the 1991/92 El Nino and minor El Nino in 1993 by Mount Pinatubo also contributed to the similarity of the averages. Note that part of the rises in the low latitude Central American and North Atlantic TLT anomalies result from the Atlantic Multidecadal Oscillation (AMO). Also note how much larger the responses to the 1991 Mount Pinatubo eruption are for the two datasets that include the greatest land areas, the Old World West (Figure 13) and Old World East (Figure 14). I’m not one for trend analysis, but there are those who are, so I’ve included the graphs that were the bases for the preceding period-average graphs, without the notations. At the end is a gif animation of the six low latitude Northern Hemisphere TLT anomaly subsets for comparison. The three oceanic TLT anomaly datasets in this post afford the opportunity to compare them directly to SST anomalies for the same areas. Note that the low latitude North Atlantic TLT anomaly data also includes small portions of Western Africa and Northern South America, so there will be minor land biases in that data. The low latitude Northwest and Northeast Pacific TLT data include no significant lass mass. These comparison graphs are being provided for reference only at this time. In a future post, I’ll discuss the very basic reason for the differences, which, on a global basis, is easiest explained as a difference in response of SST and the TLT over oceans to ENSO events. As illustrated in this post and in the two previous posts in this series, El Nino events and volcanic eruptions dominate climate over the term of the satellite-based TLT data. In the next part of this series, I’ll examine the low latitude TLT anomalies for the Southern Hemisphere. Since the Indian Ocean plays a larger role in the Southern Hemisphere and the Southern Ocean has an influence, there may be differences. Under the heading of TLT VERSUS SST, I noted that the difference between TLT over oceans and SST is a function of ENSO. Subtracting the Global OI.v2 SST Anomalies from the AHU MSU Global Ocean TLT for the period of November 1981 to November 2008 creates the temperature difference graph illustrated in Figure 25. There are, of course, volcanic eruption influences. Examining TLT over the oceans and SST anomalies in any detail regionally would require knowledge of weather at the time, and that’s beyond my capability. And since the modeling of El Nino events with any accuracy is beyond the capabilities of GCMs, it would make regional prediction of climate difficult for those few GCMs that attempt to model ENSO. For those GCMs that don’t model ENSO well or at all, regional climate predictions should be impossible. The Optimally Interpolated Sea Surface Temperature Data (OI.v2 SST) and Extended Reconstructed Sea Surface Temperature Data (ERSST.v2) are available through the NOAA National Operational Model Archive & Distribution System (NOMADS). A Precursor of a Strengthening La Nina?